The Royal Commission’s early inventories offer fascinating insights into the historic built environment in early-twentieth-century Wales and how it was perceived by contemporaries. While their focus on medieval and pre-medieval structures may seem limited today, they also contain many unexpected gems. One such gem from the Radnorshire Inventory (1913) is a fascinating example of early-twentieth-century folk-culture: the King’s Rent Hole. 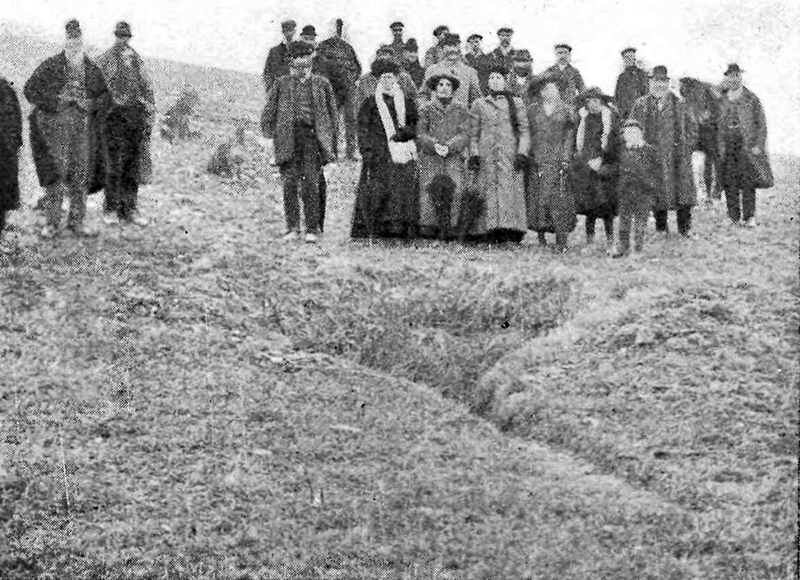 Members of the community gathered at the King’s Rent Hole in 1913. The weather was stormy on 20 January 1913. Snow lay on the hills as Edward Owen, the first Secretary of the Royal Commission on the Ancient and Historical Monuments and constructions in Wales and Monmouthshire (now known as the Royal Commission on the Ancient and Historical Monuments of Wales), visited a site near Tyn-yr-ynn (NPRN: 423735) in Llanbister parish. The Commission’s investigators had already surveyed the parish in June and July 1911, but Owen’s interest, as the Inventory states, was ‘not so much in the place as the quaint ceremony annually performed thereat’. Owen described the importance of this ceremony in his write-up of the day, preserved among his papers in the National Library of Wales, as ‘a survival of Welsh tribal custom into the English manorial period’. Whether the ritual constituted such as survival is debatable, but the event he recorded is nevertheless an important example of Welsh folk-life. The hole was a roughly oval depression 2m in diameter at its longest axis and around 1.2m deep, approached by a trench roughly 2.75m long and 0.6m wide. Every Hilary Monday (the Monday following 13 January) the people of the Crown manor of Swydd Ugre gathered to choose who among them would collect the money known as the ‘King’s rents’ for the following year. The ceremony began around 11.30am with the previous year’s collector declaring that all rents had been collected under his tenure. He would then, if seeking re-election, proceed bareheaded down a trench repeating a formulaic speech detailing the amount he would collect from each family. Reaching the end of his speech and the trench, he entered a hole dug into the side of the hill where he awaited other contenders to attempt to underbid him. These proceeded with the same ceremony until the lowest bidder was found. 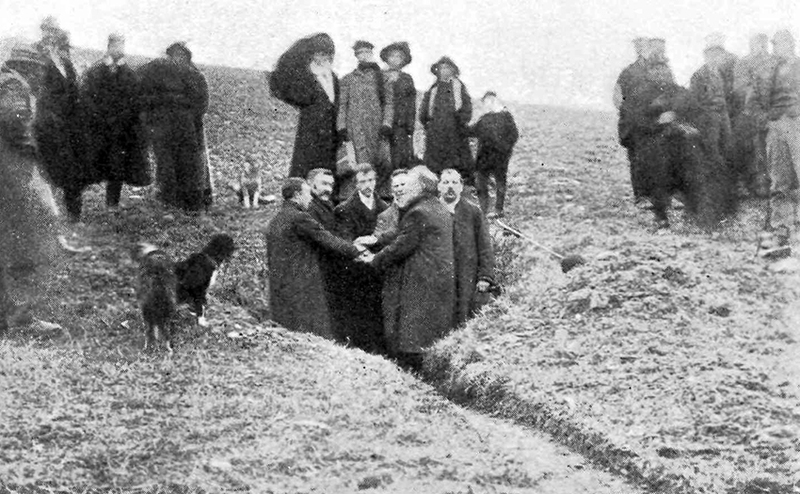 The contest ended at noon, when the successful candidate was joined in the hole by four witnesses and a ‘King’s witness’. These men would then place their hands on top of each other, with the King’s witness’s hands above and below the stack, and swear that the new collector would do his duty. The form and liturgy of the ceremony were consistent. Thomas Williams, a local octogenarian who had been attending from the age of ten, confirmed to Owen that there had never been any deviation from the formula. The successful candidate for 1913, with his witnesses and the King’s Witness, swears to deliver the King’s Rent. It was not to last, however, and the practice was discontinued in the 1920s, when the hole was filled in. Other similar ceremonies had ceased before the twentieth century. The Radnorshire Inventory notes that a similar ritual had been formerly performed at a place called ‘The Holey Piece’ in Llangynllo parish. While it lasted, however, the King’s Rent Hole was a delightful part of the rich New Year’s folk-culture of Wales, as integral a part of the ritual year to the communities which performed it as the Mari Lwyd or calennig were to others. ‘Edward Owen Papers: Rough transcripts of miscellaneous documents relating to the counties of Pembrokeshire and Radnorshire (St Davids etc. ),’ National Library of Wales, MS. 18065E. Royal Commission on the Ancient and Historical Monuments in Wales, An Inventory of the Ancient Monuments in Wales and Monmouthshire. III. County of Radnor (London: HMSO, 1913), esp. p. 68. W.H. Howse, Radnorshire (Hereford: E. J. Thurston, 1949), pp. 214–15. J. Moseley, ‘Parish of Llanbister’, Radnorshire Transactions, III (1933), 41–45 (esp. 43–44). Roy Palmer, The Folklore of Radnorshire (Little Logaston: Logaston Press, 2001), esp. pp. 235–36. For other New Year’s customs in Wales, see Trefor M. Owen, Welsh Folk Customs (Llandysul: Gomer Press, 1987 (org. pub. 1959), esp. pp. 41–69. 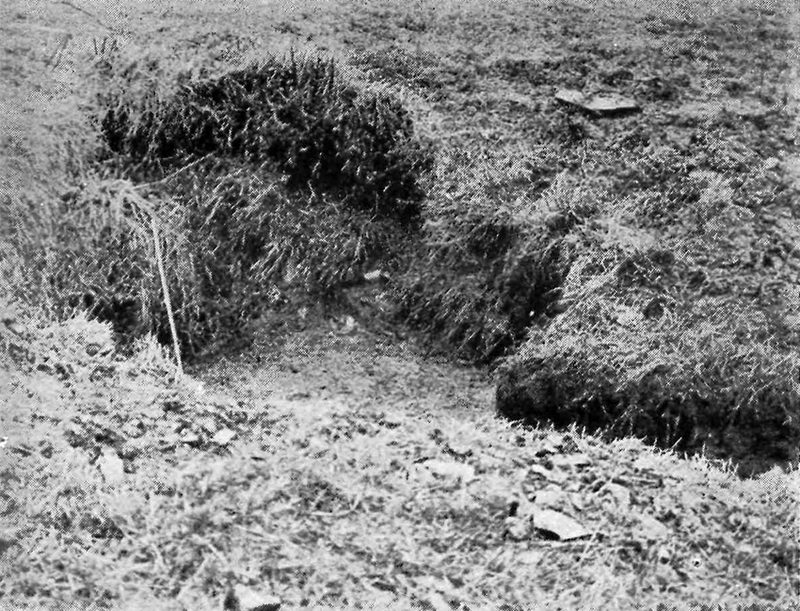 Images from ‘Fig 30 – Llanbister: The King’s Rent Hole (no. 267)’ in RCAHMW, Inventory of the Ancient Monuments in … County of Radnor, between pp. 68–69.